Vietnam's Deputy Minister of Trade and Industry Tran Quoc Khanh speaks to the media at a press meeting in Hanoi on October 9, 2015. It will take up to two years for the Trans-Pacific Partnership (TPP), which was reached after five years of talks by 12 countries in Atlanta on Monday, to be ratified in Vietnam, the lead Vietnamese negotiator of the trade deal said on Friday. The trade pact, which would liberalize trade in 40 percent of the world economy, is pending approval from legislative bodies of its members, including Australia, Brunei, Canada, Chile, Japan, Malaysia, Mexico, New Zealand, Peru, Singapore, the U.S. and Vietnam, before it can take effect. In Vietnam, the process can take 18 to 24 months, Deputy Minister of Industry and Trade Tran Quoc Khanh, who led the Vietnamese delegation at the five-day, around-the-clock talks, told a ministry-held conference in Hanoi. The law-making National Assembly is expected to begin considering the pact in mid-2016, according to The Saigon Times Online. 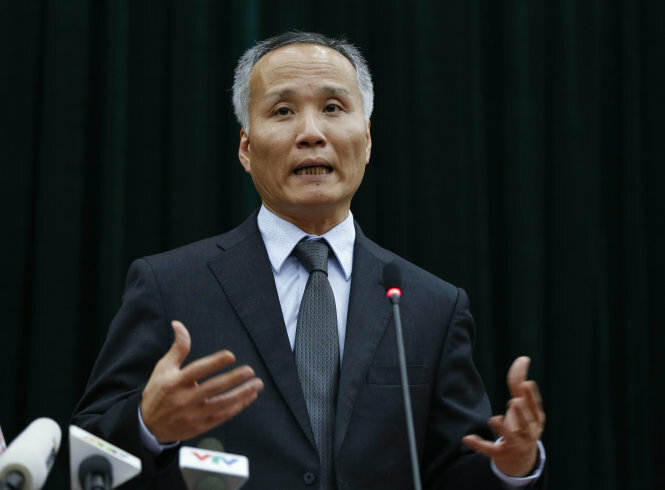 Khanh said the trade ministry will deliver an announcement about the TPP by the end of this month, but did not elaborate what will be made public. There is little available information as to what Vietnam negotiated and committed to doing during talks with the other 11 countries. “The common principle of the TPP is that all of the import tariffs will be cut to zero,” Khanh said. The duties will be kept for some “sensitive commodities,” but only with a mutual agreement among the TPP nations, the deputy minister noted. Talking of the chances and challenges the trade accord will bring to Vietnam, Khanh said the country’s industries will be divided into three groups depending on the impacts of the TPP. Such sectors as garment and footwear will enjoy benefit thanks to the tax elimination, while meat businesses will face steep competition from TPP rivals, including such giants as Australia, Japan and the U.S., according to the official. The last group consists of the dairy, animal feed and animal feed materials, which will “face less-severe impact as Vietnam already imports these products at huge quantities at present,” Khanh concluded. The chief negotiator, however, asserted that Vietnam is granted the most flexible solutions, such as given a longer roadmap to to fulfill its commitment at the TPP. The Vietnamese livestock sector, for instance, is given a ten-year period to strengthen itself before all tariffs are zeroed. “Other [TPP] countries also pledge to provide technical assistance to Vietnam in fulfilling its commitment,” he added. The deputy minister also revealed at the meeting that all TPP nations have committed not to giving too much subsidy for state-run enterprises. Vietnamese analysts and experts have been discussing about the impact of the TPP on the country’s economy after the deal was reached on Monday. The garment, footwear, seafood, and wood industries are among those that welcome the TPP, whereas domestic meat businesses are concerned they will soon be pushed out of competition. But Khanh, in a separate interview, reassured that Vietnam’s experience in integrating with the world’s economy over the past 20 years will help it afford the TPP. “This is not the first time we’ll integrate with the world… We have 20 years of experience, and a similar amount of time for preparation, so I believe we are strong enough to play this game,” he said.